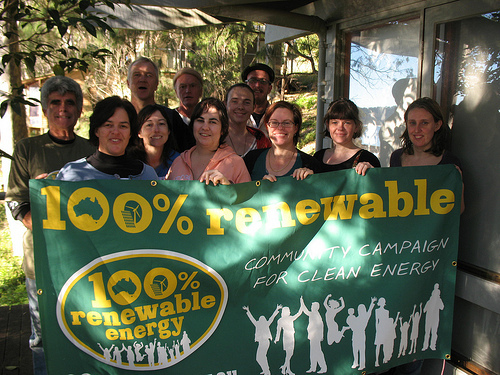 100% Renewable is a community initiated campaign working to build community and political support for renewable energy. "In a country like Australia, where the sun beats down every day, the wind always blows, hot rocks under the ground create heat, and waves on our long coastlines keep rolling in, renewable energy just makes sense. Renewable energy means clean, safe power that will never run out. It means new investment, new industry and lots of new jobs. It means a safer climate for ourselves, our children, and our grandchildren. And with our natural advantage in sun, wind and wave it means Australia could be a clean energy leader."